Actor and comedian Bill Cosby departs after the first day of his retrial for his sexual assault case at the Montgomery County Courthouse in Norristown, Pennsylvania on April 9, 2018. Bill Cosby’s celebrity defense lawyer tore into the woman accusing the disgraced megastar of sexual assault, branding her on Tuesday a lying, money-grabbing “con artist” who falsely accused the star to bag millions. The now frail and isolated 80-year-old Cosby could spend the rest of his life behind bars if convicted at his US retrial of drugging and molesting Andrea Constand, 44, at his Philadelphia home in 2004. The case has besmirched the legacy of an actor who was lauded as a hero by African Americans and revered by whites for smashing through racial barriers. 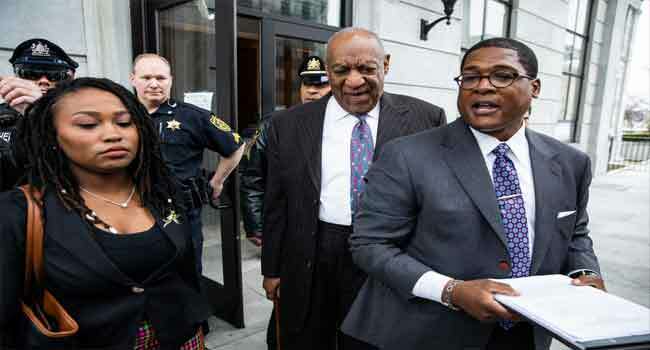 Cosby’s first trial ended in a hung jury in June last year, with a sequestered panel hopelessly deadlocked after six days of testimony and 52 hours of deliberations. On Tuesday, his new lawyer, famous for getting pop star Michael Jackson acquitted of child molestation, displayed his courtroom prowess with a calm opening statement on day two of his client’s Pennsylvania retrial. The award-winning Cosby, who says he is now legally blind, sat impassive, resting a finger against his nose and staring straight ahead as he appeared to follow the courtroom action intently. “What does she want from Bill Cosby?” Tom Mesereau asked jurors. “You already know the answer: money, money and lots more money,” he said. “What do you get?” he said, summing up inconsistencies in Constand’s story to the police. “A con artist, ladies and gentlemen of the jury. And we’ll prove it. A con artist,” he hectored. At the time of the alleged assault, Constand was the director of women’s basketball at Temple University, where the wealthy actor sat on the board of trustees. In a 2005 deposition to resolve a civil suit in which he paid Constand nearly $3.4 million, Cosby said he gave the Canadian an over-the-counter antihistamine to relieve stress. He said their relations were consensual. Cosby was the real victim, Mesereau said, with Constand purportedly confiding in a co-worker that she “could set-up a celebrity” for money. Crucial to his case will be witness Marguerite Jackson, who was not allowed to testify at the first trial on grounds of hearsay. Constand, he argued, was in debt and embittered, leading her to make the confidential settlement in 2006, the amount of which was revealed Monday by the prosecution for the first time. Mesereau alleged that Constand pursued Cosby, “madly in love with his fame and money,” driving to his home six or seven times, “sneaked in the back door” and sat alone with him by the fire sipping brandy. He asked the jury to pity Cosby, saying that despite his wealth and fame, he was still grieving the murder of his son Ennis in 1997 and was besieged by requests for money and favors. “He was foolish, he was ridiculous and lonely, and attracted to a young woman, but he didn’t commit a crime. He’s not a criminal and you will gladly declare him not guilty,” Mesereau said. “Hollywood is a treacherous place. If you’re a young star everybody wants a piece of the action,” Mesereau added. In recent years, about 60 women have accused the Emmy-winning Cosby of being a serial predator, alleging that he drugged and assaulted them over a span of 40 years. Yet the three counts of aggravated indecent assault involving Constand are the only criminal charges to stick against Cosby, with most of the alleged abuse too long ago to prosecute. His retrial is the most high-profile criminal case since the start of the #MeToo era, the US cultural watershed that has ruined the careers of a string of powerful men in Hollywood, politics and the media. Experts say the movement may make jurors more inclined to believe victims. Alluding to what he called “the current climate in America,” Mesereau asked jurors not to be blinded by accusations. He tore into the inconsistencies that Constand gave to police and the lack of physical evidence. Even after the alleged assault, she met him alone, introduced him to her parents and called him 75 times, including late at night and twice on Valentine’s Day, he said. The prosecution followed Mesereau in calling their first witness, an expert in sexual assault victims.